Do you like Spring Rolls? Or have you ever wondered how to make this cute little thing? Read on! Today we have Benjamin sharing his story with Chinese Spring Rolls and his amazing infographic illustration. Hope you’ll like it! Chinese Spring Rolls – or 春卷 – are a very popular appetizer, especially around the Chinese Spring Festival season (hence the name!). They’re filled with fresh springtime vegetables, which at springtime make a wonderful contrast to the heavy preserved foods from the winter months. My memories of spending time with friends and family when I lived in Nanjing a few years ago is forming whole production lines to make huge batches of these. My Chinese friends were definitely not shy to let me know when I had made a mistake but all of the hard work we put in paid off – these are delicious! 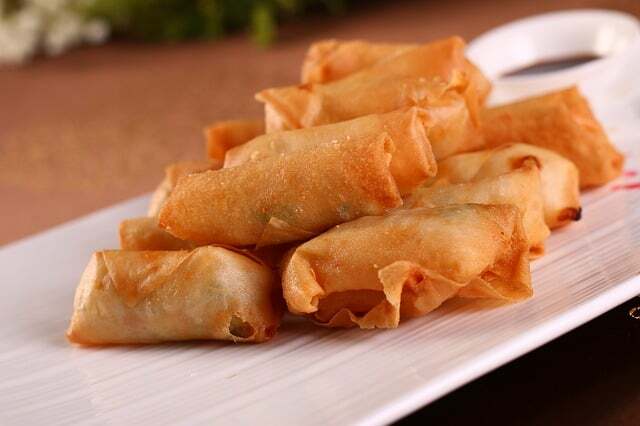 Traditionally, spring rolls are beautifully crafted crispy, thin wrappers filled with an assortment of vegetables. However, as the recipe has evolved and spread to other regions of East Asia, it has also started to incorporate other fillings, such as shrimp or pork. Spring rolls are now not just native to Mainland China, but also Hong Kong and even further afield, in countries like Vietnam, Thailand and Malaysia. No matter where you live in the world, you can make it yourself at home or order from any Chinese restaurant. Recipes for spring rolls vary wildly depending on the country you’re in: Vietnamese rolls tend to be small; Thai rolls are often thin; and Phillippino rolls tend are very densely packed. However, today we’re going to concentrate on the original: The Chinese Spring Roll. With the size of China as vast as it is, takes on the recipe depend on the region of the country, and even different families sometimes have their own spin on it. Unsurprisingly, every family thinks theirs is the best! Over at The Online Grill, we’ve put together a Chinese spring roll recipe of our own together. While traditionally, many recipe call for pork or just pure vegetables, we’ve given it a spin with chicken to help inject a bit more invention into proceedings! Enjoy our handy recipe infographic and let us know what your favorite spring roll filling is!